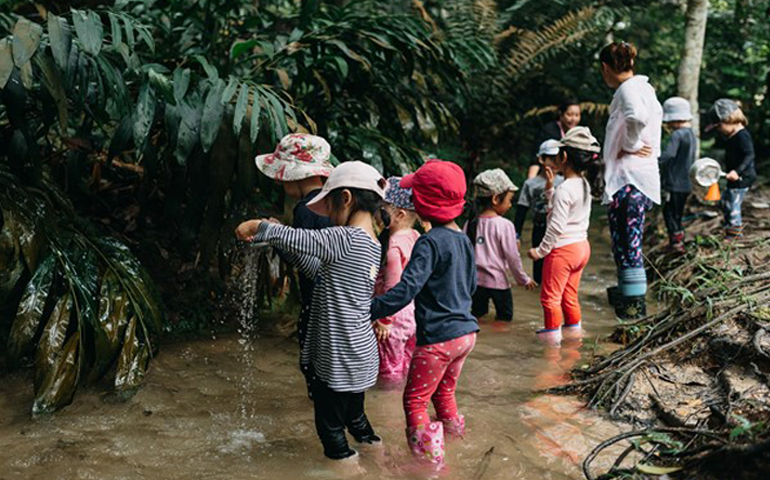 The Jungle School programme at the Garden International School Early Years Centre is the only one of its kind in Malaysia and the perfect learning environment for young children. Children should love going to school and it’s especially important to begin their educational journey on the right foot. The pre-school years from the age of three to five are when children get their first experience of going to school, learning and socialising; and parents who are looking for a unique programme should consider the Jungle School. The Jungle School is an innovative programme offered at the Garden International School Early Years Centre (EYC). Inspired by the European Forest School concept and implemented in 2014, this programme revolves around developing confidence and self-esteem, and teaching core skills through learning experiences in the outdoors. What do the children do? A typical day at the Jungle School ‘base camp’ is filled with exciting activities designed to instil confidence and inspire learning, and for the children to have fun and explore. One day they may be making boats, climbing trees and playing with mud; while the next could see them estimating the height of trees, playing games and observing insects! There’s never a dull moment and the children are always engaged with skilled practitioners enhancing the learning experience. While the children participate in the many interesting activities, they’re constantly learning and building critical skills – communication, resilience, problem solving, risk taking – in a safe, natural environment. These skills support future academic, social and emotional development, and is linked to GIS’s whole school vision. This programme encourages children to enjoy nature, to learn how important it is to us, and ultimately how to protect it and become ‘ambassadors of nature’. The children’s safety is of utmost concern at Jungle School and the Early Years Centre team select activities and locations based on suitability, safety and thorough risk assessments. Clear rules and location boundaries are very clearly communicated to the children and ensure they can enjoy their outdoor learning experiences safely. For a first-hand experience of the Early Years programme at Garden International School, join them at their Open Day on 27 September 2018. To register visit gardenschool.edu.my or call +603 6209 6888. The POWIIS English Language Entry Programme (PELEP) is an English immersion residential programme for students transitioning to secondary school, created to ensure they begin school with language confidence. Your child's speech and language development is an integral aspect of development and as parents we worry if they are developing accordingly. What should you do if skills are felt to be lagging? The only school offering the Canadian curriculum in Kuala Lumpur, Sunway International School will be having a parent info session at their Sunway City campus. The International School of Kuala Lumpur (ISKL) recently hosted the regional IASAS Rugby and Touch tournament with 150 visiting athletes from across Southeast Asia.